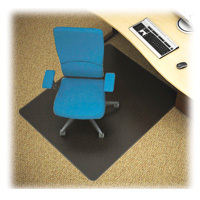 Black chair mats are recommended for low pile to medium pile commercial grade carpeting. At approx. 1/8" thick, these black chairmats are designed to stop your chair from rolling away and protect your floor. These chairmats offer a unique look and protect your carpet from damage. This Black chair mat is perfect for the home office or providing a distinct look. We recommend a BEVELED edge for a smooth transition on and off the chairmat. These black chairmats carry a lifetime warranty against cracking.